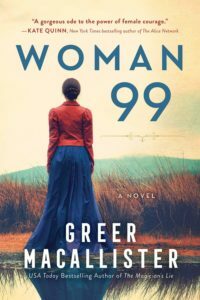 Woman 99 by Greer Macallister is what I call “historical adventure fiction”. It’s about Charlotte Smith, a wealthy young woman growing up in 1880s San Francisco whose sister Phoebe has been sent to Goldengrove, a renowned insane asylum in Napa Valley, due to her erratic mental health. For a few reasons, Charlotte feels responsible for her sister’s being sent to Goldengrove and decides to rescue her by getting herself committed there too. This may not be a smart plan, but it allows Woman 99 readers to follow along as Charlotte ends up at Goldengrove, a place that turns out to be much more sinister than it’s purported to be. Not everyone at Goldengrove is insane, it turns out – many of the women there are simply inconvenient, and their husbands or families want them to disappear. Conditions at the asylum border on inhumane, and as Charlotte learns more about the doctors, nurses and “cures”, she becomes increasingly outraged at the ways the women are treated. She also has to locate her sister, which proves to be much more challenging than she’d hoped, and find a way to get them both out. Woman 99 is a story about female resilience and the loyalty between sisters, as well as a sad statement about the treatment of women at the end of the 19th century. Goldengrove is fictional, but Macallister did her research into private asylums at that time and created a place that is sadly entirely conceivable. Charlotte’s character is inspired by Nellie Bly, a real American journalist in the 1880s who herself exposed brutality and neglect at asylums for women, and Bly’s writing clearly informed Macallister. Woman 99 is a bit of a departure for me – I don’t usually read books heavy on adventure and twists, but I enjoyed this one a lot. Charlotte was forced to be resourceful in the face of very long odds and depended on help from the friends she makes within Goldengrove, women whom others have written off. There are many disturbing images throughout Woman 99, but is ultimately a hopeful story of empowerment and justice. 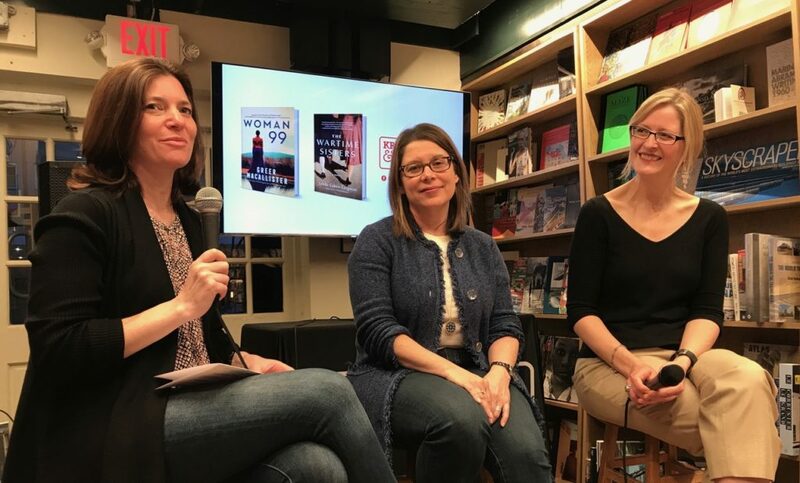 I was very luckily invited to moderate a panel with Greer Macallister and Lynda Cohen Loigman last night at Kramerbooks in DC to talk about Woman 99 and Lynda’s new book, The Wartime Sisters (reviewed here). It was a great time! Here’s a pic of us during the discussion.